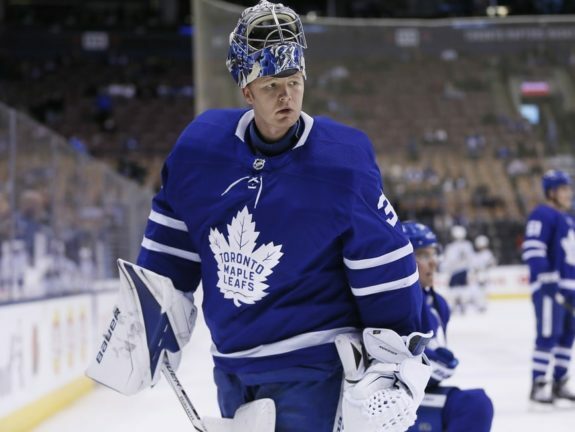 Frederik Andersen has quietly been the backbone of the Toronto Maple Leafs this season. 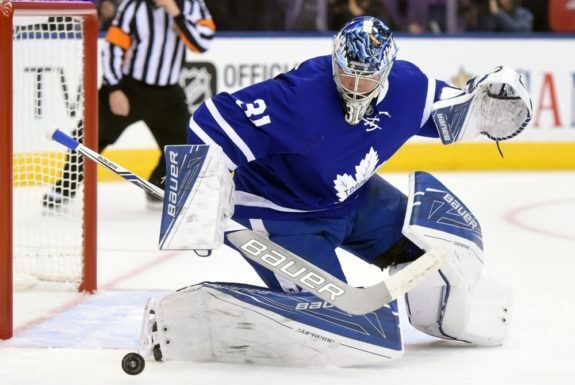 Now in his third season wearing the blue and white, the Maple Leafs knew they had a strong goalie, someone who has helped guide them to back-to-back playoff appearances. He has had a great start to the season, and it’s helping Toronto get through a tough period with Auston Matthews on the shelf for at least the next few weeks with an injured shoulder. There have been times where the Maple Leafs have struggled putting up goals, but Anderson has been a constant. The Maple Leafs were off-season darlings this summer after adding John Tavares to help lead a star-studded roster along with Matthews and Mitch Marner. William Nylander’s holdout continues to be tracked with great interest while the emergence of Morgan Rielly and Kasperi Kapanen has been profiled to a large extent as well. And of course, we can’t forget the fallout after Matthews’ injury. With that much talent, it can be easy to overlook someone like Andersen, who has been good the last few seasons, but has yet to crack the NHL’s top tier of netminders. Going into this season, Anderson knew he had another level to reach, and early this season, it looks as though he’s has done so. He’s not far removed from his first shutout of the season, a 5-0 win over the Pittsburgh Penguins on Nov. 3, and he was magnificent in Toronto’s latest win, a 3-1 decision over the Vegas Golden Nights on Nov. 6. After Matthews was sidelined on Oct. 27, our Michael Singh questioned who would rise in his absence. Nazem Kadri was a likely candidate and has come through with four goals in the last six games after going scoreless in the first nine games as Toronto’s third-line centre. Andreas Johnsson was also pondered as a possibility, and although he’s still scoreless after such an impressive 2017-18 season with the Toronto Marlies, he has been playing noticeably better as of late and has been rewarded with an increase in minutes over the last three games. The third and final candidate was Andersen, who has risen to the challenge as well. He finished October with a save percentage higher than .900 for the first time as a Maple Leaf. Will Andersen Be Vezina Worthy? Following Tuesday’s win over Vegas, a game in which Andersen bailed his teammates out as Vegas finished with a 37-21 edge in shots, Andersen’s save percentage stands at .929, good for fourth in the league among goalies who have played at least 10 games. Also out of that sample size, Andersen’s 2.18 goals-against average is second behind Andrei Vasilevskiy. In the past few seasons, Andersen has been solid, but has fallen just short of the Vezina conversation. Andersen has been one of the top goalies in the league to start the year. It also helps that he has a strong team in front of him, even though there have been a few games like Tuesday where he has been relied on more than a coach would normally prefer. He has shown a tendency of performing well from November to January, so if he can continue that trend this year, then his start is very encouraging. Anderson has played in all but two out of 15 games for Toronto this season and has guided the team to eight wins. He has played 66 games in each of the past two seasons and is on pace for an even larger workload this year. Will His Teammates Help Him Out? Yes, the Maple Leafs have racked up a few wins since Matthews went down, but by no means are they out of the woods yet. Tavares and Matthews have cooled down from their electric starts. Tavares has only scored twice in the last 11 games, and Matthews went scoreless in the last give games before he was hurt. They’re bound to get back on track, especially considering Tavares’ last two goals have come on his last 39 shots. Questions still surround Toronto’s secondary scoring, as there are 10 players who have suited up in at least 10 games, but have yet to reach the two-goal mark. As well, Tuesday’s game was the first home contest since Oct. 15 in which they scored within the first two periods. That's five consecutive home games in which the Toronto Maple Leafs have failed to score a goal in the first two periods. Early this season, the Maple Leafs won a 7-6 thriller against the Chicago Blackhawks, followed by a 7-4 win over the Dallas Stars. It was clear that pace wouldn’t be sustainable and they would have to rely much more on their defence to win games. They’ve managed to do that lately as Andersen has allowed two goals or less in eight of his last 10 games. Andersen is averaging just over 30 shots faced per game this season after facing over 33 per game last season. As long as the Maple Leafs don’t allow that number to get out of control, they should be able to remain a top team in the Eastern Conference.